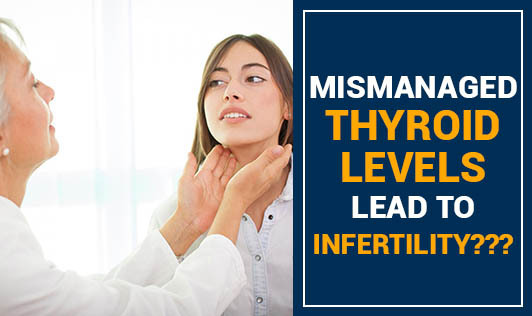 Mismanaged Thyroid Levels Lead to Infertility??? • Hypothyroidism can lead to the formation of ovarian cysts that leads to infertility in women. • Thyroid condition can affect the levels of estrogen levels that control regular menstrual cycle. • Hypothyroidism can increase the levels of prolactin hormone that regulates milk production, leading to cessation of ovulation in non pregnant women! • Women with hypothyroidism have four times higher chances of a miscarriage. Untreated hypothyroidism also increases the risk of new born babies with developmental defects and slightly slower IQ. • Thyroid medications if combined with birth control pills can affect the liver if the dosages are not adjusted. However, talk to your Doctor and get your thyroid hormones level closely monitored during pregnancy to promote normal fetal development and reduce the risk of miscarriages!